Is your PC heating up like Uncle Tom’s grill? Well, it’s definitely one of the signs that your computer might be in trouble. Heat can slow down your PC and automatically shut it down leading to data loss, or permanent damage the components. If your desktop or laptop is heating up to the point of concern, then you need to take action immediately. In this post, I will show you everything you need to know to cool down your heating PC and get it back running smoothly. Before we delve into the tips as how to cool down your PC, it is important to know why PC heats up and how the cooling system works. Every PC has multiple components with moving parts that generate heat while working. CPU and GPU are the most heat generating components. The harder these components work, the more heat is generated. If this heat isn’t cooled down, then it can stop the PC from working and may damage the components as well. Usually, computer manufacturers fit fans inside the PCs to keep the airflow going and its components cooled down. There could be multiple fans, one on the CPU, another on the GPU and more near other components. Also, on your laptop or desktop, you may have noticed one or more ventilation areas at the bottom or back, through which your PC fans ventilate the air to keep the components from heating. Note: There are also other methods to cool down a PC, like liquid cooling or even air conditioning. However, these methods are rarely used and there isn’t much you can do (apart from taking it to a repair shop) if there is a problem with them. So for this guide, we will assume that your PC uses fan/air cooling system to cool down the PC. Now if your PC is heating up, there could be only two reasons for that. Either there is a problem with the cooling system, or the components are heating up to the point your PC’s cooling system can’t handle it. In this guide, we will be giving solutions to both the problems. How much is your PC heating up? To take a suitable action, we first need to see how much is your PC is heating up. For this purpose, HWMonitor is a great free tool that will show you the current and max temperature of your CPU and GPU. Launch the tool and you will see both GPU and CPU temperatures along with some other hardware related information. Here check the "Max" temperature. If it’s anywhere over 60°C while your PC is heating, then it should be of concern and you should follow all the below-mentioned solutions to fix your heating PC. Going up to 55°C max isn’t too much of a problem if you use your PC for gaming or using heavy applications. Although, you can still follow some of the "good to know" tips below to ensure you don’t face any heating issue in the future. First, we will talk about fixing problems with the cooling system of your PC as it is usually the cause of PC heating up. Below are some ways you can fix cooling system problems. When you press the power button to start up the PC, you hear a satisfying "vroom" sound. Well, that’s the sound of the fans inside, which run at full throttle at first and then slow down as the PC boots. If you can’t hear that sound when the PC starts, or maybe you feel the sound is less powerful than before, then there is a chance that the fans aren’t working well. To investigate further, you can open up the PC to see if the fans are working or not. If you are not comfortable with opening the PC, then use a flashlight to see inside the PC’s ventilation holes for running fans. If you are not able to see any movement, you should immediately take it to a repair shop before the heat melts down the components. First, completely turn off the PC and unplug it. Now open the cover and you should be able to see visible dust. To clean it up, you can use a can of compressed air or a leaf blower (at slow speed). Blow the main PC components with air, especially the fans, from both front and back sides. You can also use cotton buds to clean up the narrow spaces. However, don’t worry if you can’t get it sparkly cleaned, as we are just looking to get rid of any blockage caused by dust. I had the same problem with my heating PC. It would go over 80°C with only a few hours of use. A good blow with a leaf blower got rid of all the dust and now it hardly goes near 55°C at max usage. Thermal paste is usually a highly conductive material that is applied between CPU/GPU and heatsinks. This paste ensures that the heat is properly moved out of the PC. If this material gets old, it will definitely affect the effectiveness of the cooling system. If the above tips don’t help, you can also try reapplying the thermal paste. Here is a detailed step-by-step article on how to properly buy and apply thermal paste. If the fans are working fine and there is no dust problem, then the other reason of a heating PC may be that its components are generating so much heat that the fans aren’t able to handle. Especially if the PC is old, there is a chance that it may generate more heat as compared to when it was new. Overclocking your CPU and GPU is a great way to get more out of your PC. If you have overclocked your PC, then most probably you already know that it also leads to generating more heat, as your CPU and GPU will have to work harder to give you the speed they are not intended to provide. To stop PC from overheating you should clock back to original speed. It is better to save PC components, than to get temporary speed boost. There is also an option to speed up the cooling system more than normal. You can use the free SpeedFan program to monitor and control your PC’s fan speed. The application allows you to control the speed of your PC fan manually or by using certain presets. You can also allow it to automatically manage fan speed according to current temperature of your PC. Unfortunately, it doesn’t work for all the PCs. Some motherboards don’t allow control over fan speed, so there’s a chance that this option may not work for you. If you’re still interested in controlling your PC’s fan speed, you can use an external fan controller, such as this offering by Zalman. You can attach the controller to your PC and it will allow you to manually control fan speed (no software needed). If you are putting more pressure on your PC than it can handle, it could be the cause of heating PC. Don’t continuously use your PC for heavy gaming, especially the ones that your PC resource can’t even handle. If the game or software you are using faces lag or slow downs, then this means it is not meant for your PC and you are just putting pressure on your PC. Only use programs that are compatible to your PC, and don’t use a program continuously that takes up over 90% of your CPU power. Laptop users should take note of this advice. Unlike overclocking, underclocking your CPU will also lead to generating less heat as the CPU isn’t being used at the speed it is built for. Of course, this will also affect the performance of your PC, but you shouldn’t be using too heavy applications on a heating PC anyway. You can underclock your CPU using multiple methods. You can either do it from PC BIOS (if supported), use a third-party application like Intel Extreme Tuning Utility, or do it from operating system’s power options. Doing it from the operating system’s power options is a much easier solution than the others. We will show you how to do it in Windows, you can search your operating system’s power settings for a similar option. In Windows, press Window + R and type "powercfg.cpl". 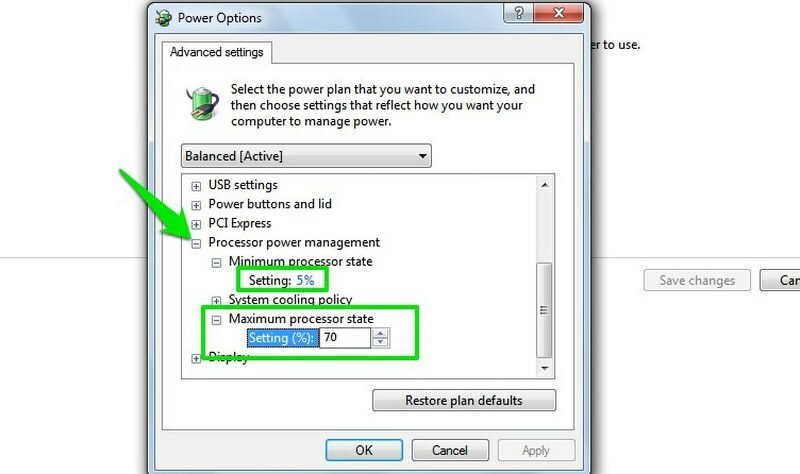 This command will open power options, here click on "Change plan settings" next to your current plan and then click on "Change advanced power settings" on the next page. In the advanced power options, click on the "plus" (+) button next to "Processor power management" option to expand its settings. Here set "Minimum processor state" to "5%" and "Maximum power state" to your desired percentage. For example, you can set "Maximum power state" to "70%" to only allow the processor to reach max 70% of the total processing power under pressure. In most cases, 70 to 80% should be enough to put less load on the processor and have a stable system. While you are at it, you should also try to use your PC in power saving mode instead of high performance. In power saving mode, the PC focuses more on working passively than actively putting pressure on PC components. So this also generates less heat. The above solutions should be enough to cool down your PC if there was a problem with cooling system or the damage wasn’t too much. However, if your PC is still heating up, you may like to give an external cooling system a try. Laptop users can use a portable cooling pad to increasing cooling power of the PC. These pads usually use fans that attach to your laptop and increase the airflow, such as this HAVIT cooling pad. There is also a PC cooling trick that takes advantage of copper coins. As copper has more thermal conductivity, it can absorb more heat if you place them on top of your PC. Here is a detailed article on copper coin trick. Do keep in mind that this trick isn’t backed by any experiments, although it does make sense. A heating PC should never be ignored as the more your PC heats the more permanent damage will be caused to its components. I give you this advice as I also once ignored my heating laptop and when I got it repaired; it never gets to achieve speed and stability as before. In most cases, it would be the dirt inside your PC that would be the cause of PC heating. Although, extreme PC usage or overclocking are main factors as well. Do let us know in the comments if you managed to fix your heating PC and how you did it.